Prep Veggies. Put your cube steaks on a plate and season both sides with salt, pepper, and a big pinch of Texas Cajun Seasoning. Put 2 big spoonfuls of flour on top of the steak and rub in, flip and repeat. Pour enough oil into your skillet cover the cooking surface with oil, about 1/3-1/2 cup. Heat oil on medium high. When oil is nice and hot, test with a pinch of the flour for the steak plate to see if it bubbles & sizzles. If it does then add your steaks to the pan. Cook at medium high for about 3 minutes on each side. Remove steak to a clean plate. Remove Pot from burner, discard all oil except about 2 tablespoons. Return to heat, add mushrooms and onions and stir to get any brown bits from the bottom of the pot. Add a pinch of salt and pepper. Cook until mushroom and onions start to turn golden, make sure nothing burns. Add just shy of 2 table spoon of flour and stir until veggies are coated. Add Chicken stock and stir well. 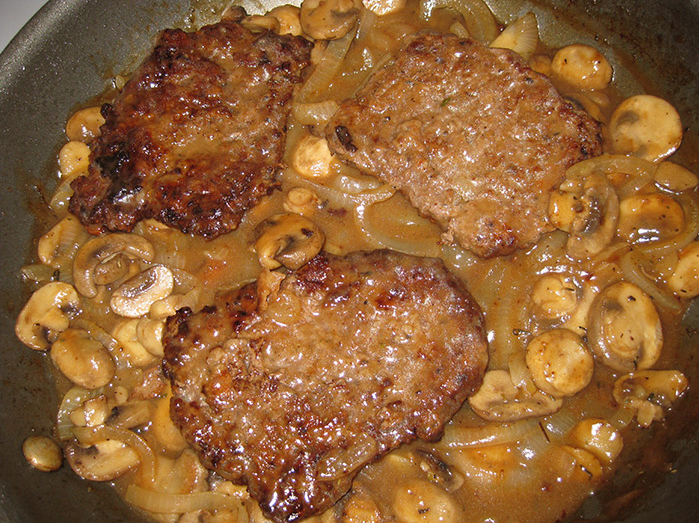 Cook on medium high, until it has thickened and the return steaks and flip around in the gravy. Serve with Texas Mashed Potatoes, and steamed carrots, broccoli, and cauliflower.